Though you may be planning to wait until your long-awaited vacation to finally get some sun and start your summer tan, there are a number of reasons why it’s better to jump-start your summer vacation tanning before you hit the beaches. Not only are you less likely to end up burnt to a crisp after just one day outside — and resigned to your hotel room smothering yourself in aloe vera — but you’re also more likely to feel confident from the moment your toes hit the sand, which means you’ll be able to maximize every minute of your getaway doing what you want to do. Below, we’ll dive into the reasons why it’s best to prepare your body — and tan — prior to your trip, but the bottom line is: there’s no reason to put off looking good, right?! Most people agree that they feel better and look better with a little color. Whether it’s because darker skin makes bright sunny colors pop or makes us feel as though we’ve been hitting the gym (even if we haven’t! ), a tan can provide a great boost of confidence. If you’re about to head off on a vacation, particularly one that may involve showing more skin than you’re used to, preparing yourself with a few tanning sessions will undoubtedly make you feel more ready to throw off your office cardigan and get into a bikini. Vacationing is a time for you to feel your best, so why wait until the very end of your vacation to have a little summer tan? Get ready to relish every moment of your holiday with a beautiful base tan, before you board the plane. Vacationers are more likely to overexposure themselves to the sun when they strip down to a bathing suit and realize how pasty white they are. Avoid falling into that summer vacation tanning trap by arriving with a tan — and seek out sun exposure in smaller doses, armed with SPF. Nobody wants to spend a vacation in their hotel room soaking in aloe vera lotion because they overdid it on day one. Remember Why You’re Here… and Relax! Your vacation is a time free of schedules, appointments, and calendar updates. Just like you don’t want to be watching for phone for an important email, you really don’t want to be watching the clock until it’s time to flip over, so you tan evenly. Your friends or family are going to be disappointed to hear, “No, I can’t do that right now — I’m laying out for two more hours.” This time is supposed to be all about your enjoyment and relaxation; you should be able to say “yes” to anything! We want you to make the most of your hard-earned summer getaway. Whether you have a few months until you hop on a plane, or just a few days, we can ensure you’re bronzed and beautiful prior to hitting the beaches. 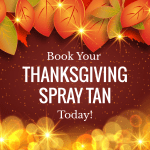 Give us a call today to get ahead of the summer vacation tanning game. We can personalize your tan to suit your needs.